Have you gotten your Christmas meal plan ready? I’m sure with lots of family and friends around at this time of year, meals need to abound. Are you doing a traditional turkey or ham dinner? With mashed potatoes and gravy? Or maybe you could try a different kind of potato. Like twice-baked? 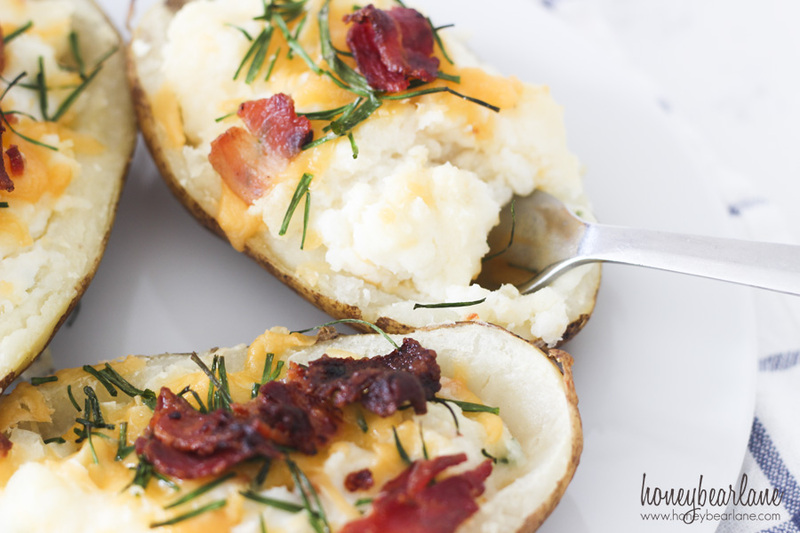 These twice baked potatoes are so yummy and such a treat! I’m not going to lie, these potatoes kind of take a long time. But what’s great about them is that you can make them ahead of time and freeze them. So if you take an afternoon to just make a whole bunch, you can freeze them and serve them all winter break long. To make these, you will want to get some large baking potatoes. However, that being said, you can get away with smaller ones too, which I think make for a great side dish. Bake your potatoes at 350 for about an hour or longer if you think they need it. One thing I did also was brush some olive oil and salt them and wrap them in foil. However after they’ve baked awhile in the foil, I took them out and let them bake for about 10-20 minutes more. This gives the outside a yummy crispy salt flavor. At the same time, fry about 8 strips of bacon for crumbling on top later and grate 1 cup of cheddar cheese. Once the potatoes are done baking, let them cool for a little while. It helps to cool if you cut them in half lengthwise. 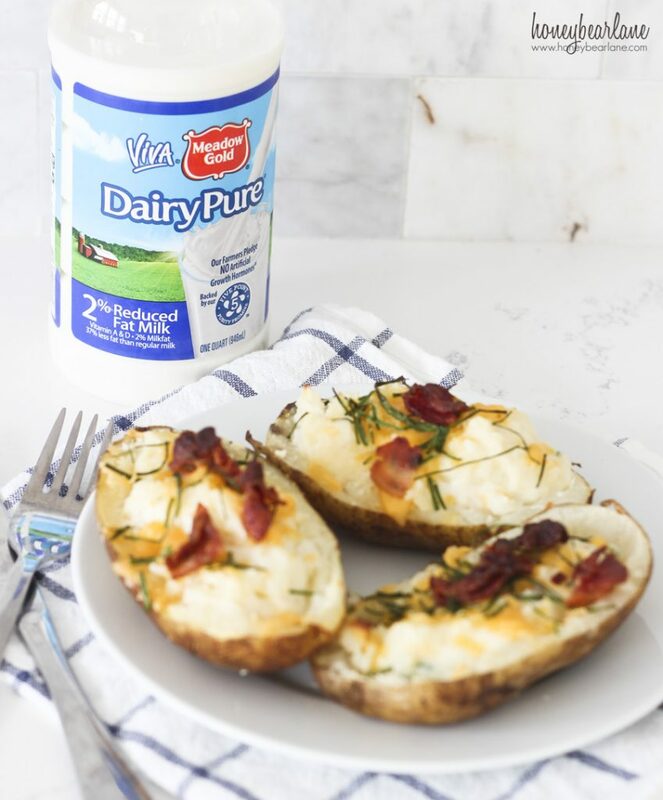 Once they are cool enough to handle, scoop out the inside of the potato shell and put the insides into a mixing bowl. But here’s the key: Don’t scoop everything away from the shell because you need the shell to hold up. Leave about a 1/4-1/2 inch thickness of potato in the shell. 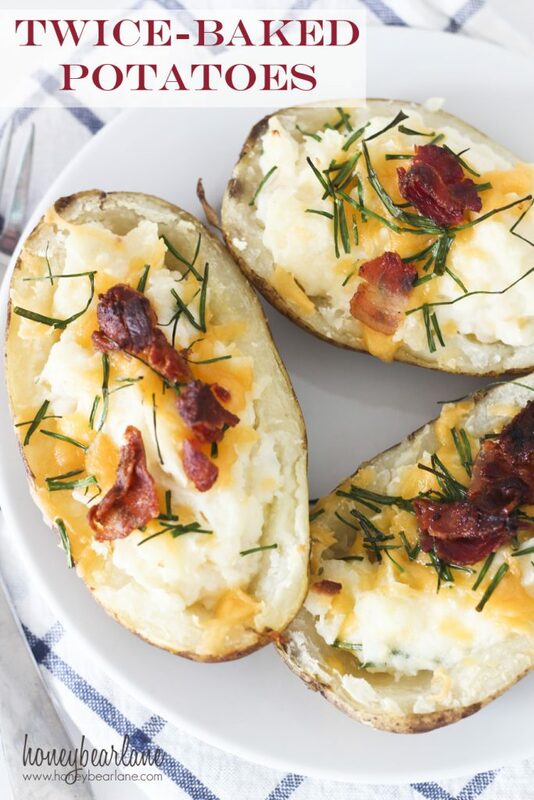 Take the potato in the bowl and mix in two cups of sour cream, 1 cup of milk, half of your grated cheese, salt and pepper, and 1 stick (8 Tbsp) of softened butter. Add some more milk if you need to get the right consistency, slightly thicker than mashed potatoes. My favorite milk to use in recipes that call for milk is DairyPure. It is the only kind of milk with a 5-point Purity promise: 1) it contains no artificial growth hormones, 2) it’s tested for antibiotics, 3) is continually tested to ensure purity, 4) it only comes from cows fed a healthy diet, and 5) is shipped fresh from local dairies. I love knowing that this milk is so pure and healthy when who knows what goes into half of the stuff we eat these days! Once you’ve mixed the potato filling, spoon it back into the potato shells. Sprinkle the rest of the grated cheese on top along with bacon crumbles and chopped chives. At this point you can either put them in the oven again for 15-20 minutes or you can lay them all on a baking sheet and freeze them. Once they are frozen hard, you can transfer them to a zipped baggie. When you want to serve them, heat your oven to 400 degrees and bake them for 30-40 minutes. We’ve been enjoying these potatoes for several days now, since they are my husband’s favorite. He’s a big potato lover and his mom used to make these sometimes before she passed away last year. It’s always nice to make some of his favorite foods from his mom to help him reconnect with her memory. Bake potatoes for an hour or until tender at 350 degrees. Let them cool for about 10 minutes and then cut in half lengthwise. Use a spoon to carve out the inside of the potato, leaving about a ¼ inch thickness of potato in the skin. Set skins aside and put inside of potato in a large mixing bowl. Add sour cream, milk, butter, salt and pepper, and half of the cheddar cheese in the bowl and mix well. Add more milk until you get a nice consistency, slightly thicker than mashed potatoes. 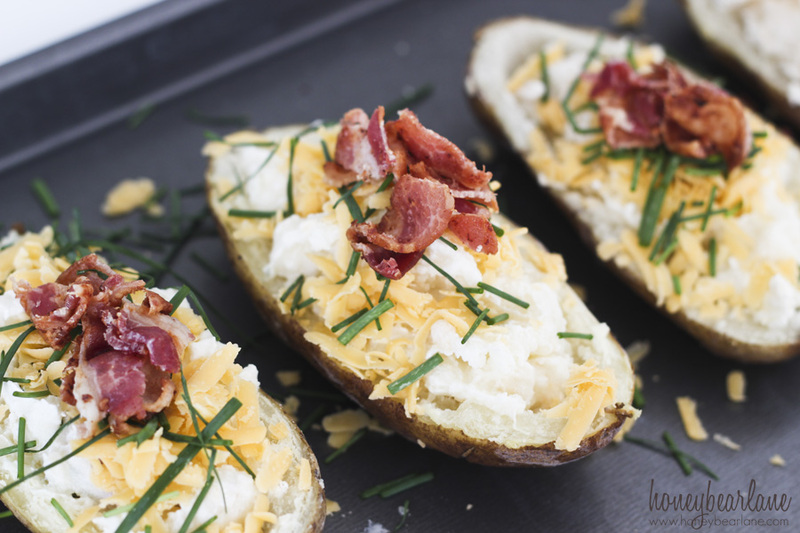 Spoon the mixture back into the potato shells and top with remaining cheese, chives, and bacon crumbles. Bake for additional 15-20 minutes and serve. Or freeze and serve later, baking them at 400 degrees for 30-35 minutes. This post was sponsored by DairyPure, all opinions are my own.